Whole Lesson including activities on ways in which we can measure weather. Independent and teacher led tasks. Variety of learning techniques and differentiated worksheets for abiltiy. 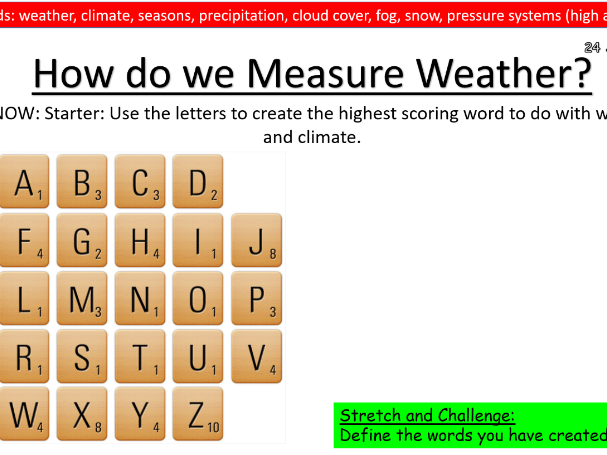 I made this aimed towards KS3 and topics on weather and climate. Geography Lesson- Extreme Weather Case Study- UK- Beast from the East. 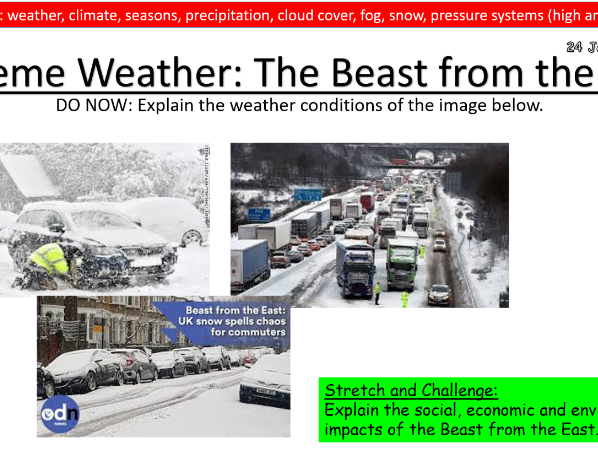 Lesson discussing causes, impacts and responses to extreme weather in the UK -Beast from the East case study. Suitable for KS3 or KS4. Videos embedded with questions. Challenge tasks for more able. 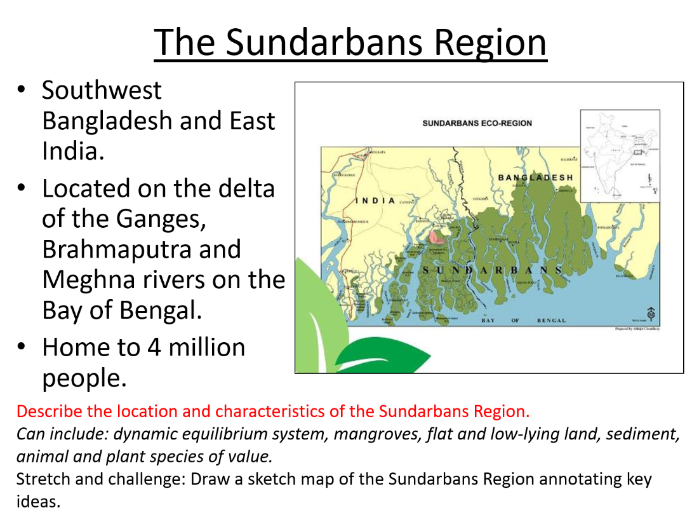 AQA Coastal Systems- the Sundarbans case study- focus on: opportunities and risks. Structured exam question at the end. 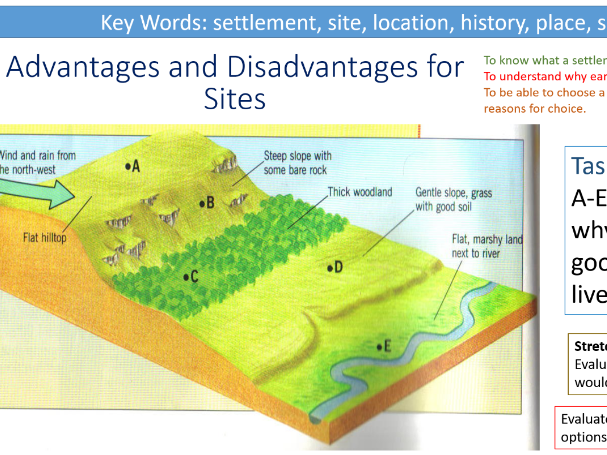 A Level Geography- Geomorphological Processes. Full lesson. 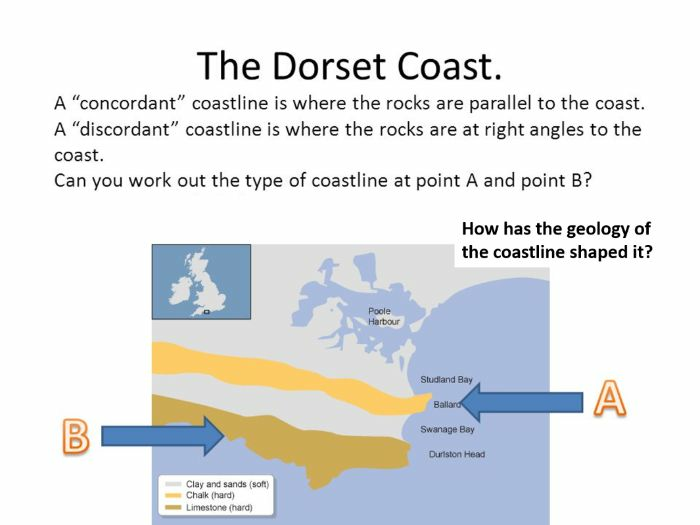 Focus on: Marine and sub-aerial processes, wave steepness, breaking points, wave energy, fetch, sea depth, coastal configuration, Beach presence and the Dorset Coast as an example, discordant and concordant coastlines. 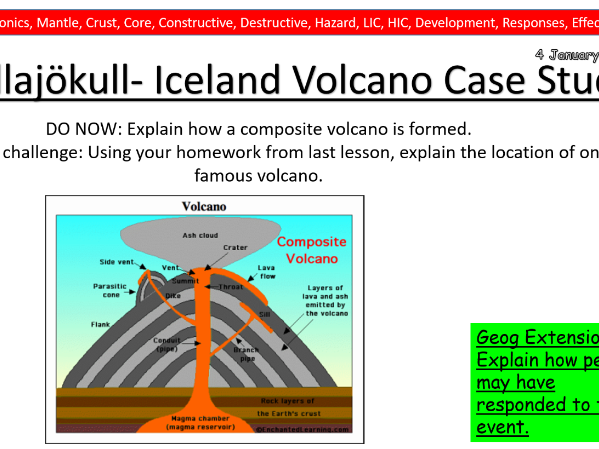 Whole lesson for Eyjafjallajökull eruption case study- Iceland. Differentiated tasks, sentence starters, key words and learning objectives. 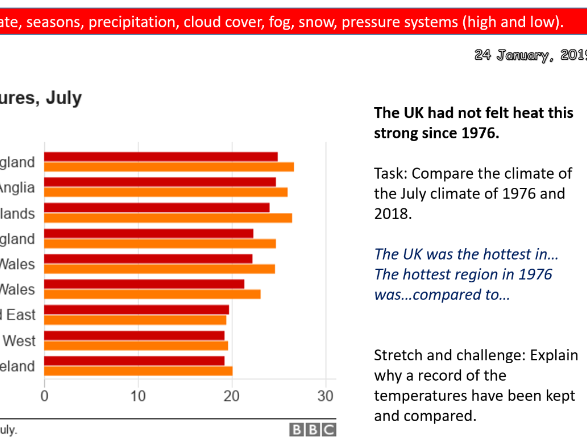 Whole lesson and study of extreme weather in the UK. Heatwave 2018 example. Includes causes, effects and responses. Sentence starters and challenge tasks to meet all abilities. Videos embedded to aid learning and visualisation. 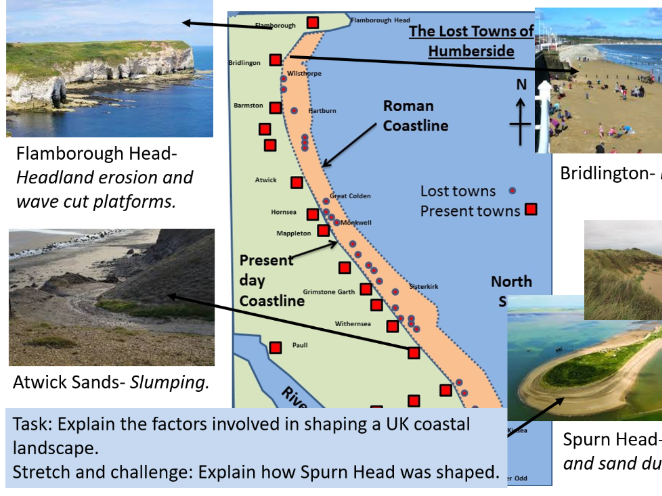 Entire lesson on coastal systems- case study: Holderness- how the landscape was formed, processes and a 20 mark practice question. 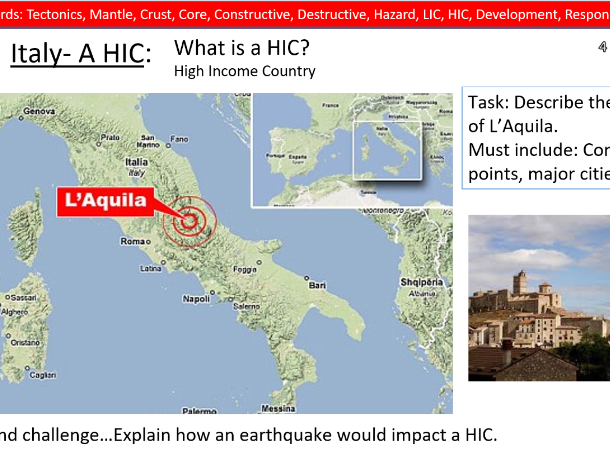 Entire lesson complete with key words, challenge tasks and learning objectives to study the L’Aquila earthquake case study- 2009. Introduction Geography lesson for Nigeria- AQA Paper 2- The Changing Economic World. 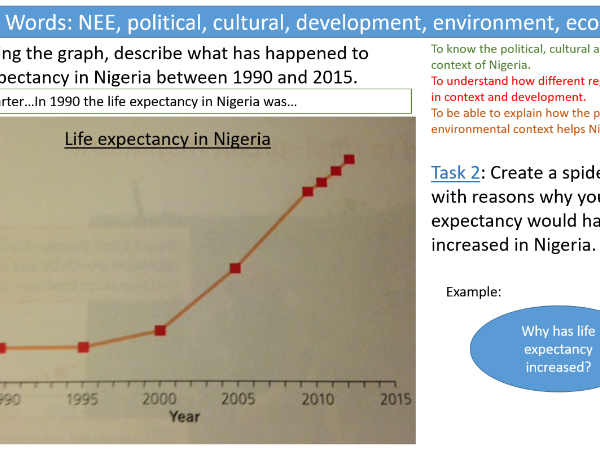 Tasks around Nigeria’s importance, status of a NEE, and how it’s growth and development has impacted quality of life. Differentiated tasks and embedded video to support learning. Graphs and skills embedded. 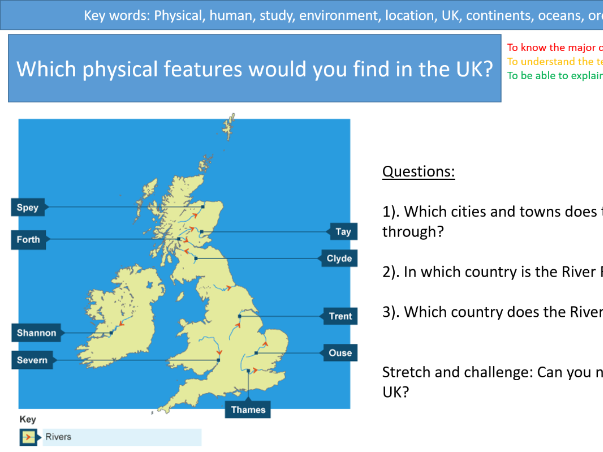 A Level Geography Lesson- Sea Level Changes- Coastal Systems. 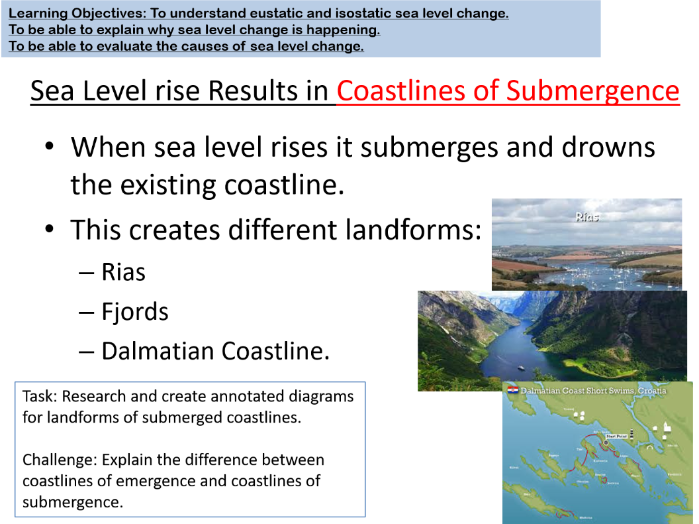 Entire lesson focus on: Eustatic, Isostatic, Coastlines of emergence and submergence. Complete with diagrams, learning objectives and tasks to fit an hour lesson. 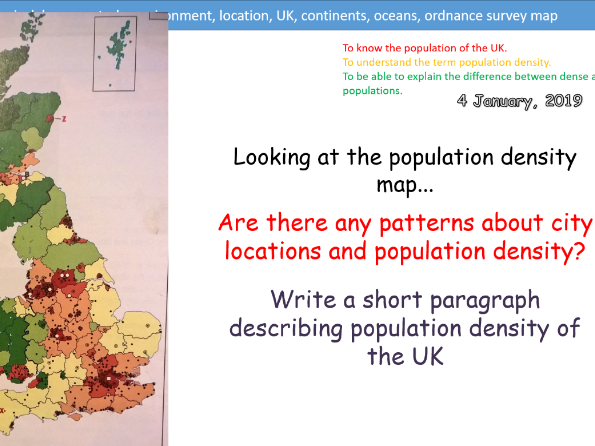 Entire lesson focusing on skills and features of the UK. 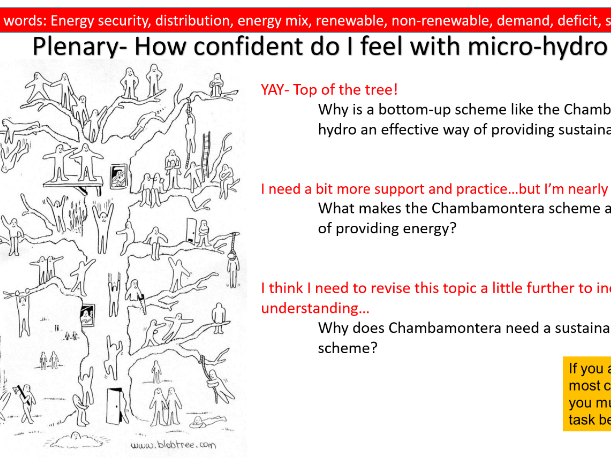 Whole lesson- GCSE Geography AQA Paper 2- Resource Management- Energy Energy insecurity- key terms and solutions. Drilling for oil and gas in the Arctic- case study- economic, social and environmental impacts of exploiting resources. Embedded videos and differentiated tasks. Whole Geography lesson- The Chambamontera Micro-Hydro Scheme- Geography GCSE- AQA Spec- Paper 2- Resource Management - Energy- Sustainability and energy production. 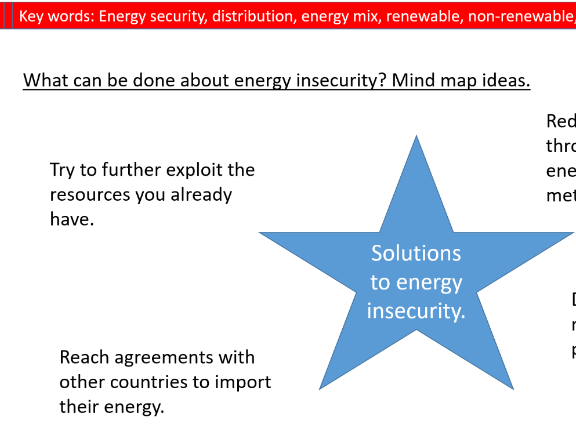 Topics- Peru and energy supply- ‘bottom-up’ schemes and productivity. Uses interactive and differentiated tasks to look at subsistence farming and micro-hydro energy schemes. Videos embedded about the case study to aid understanding- looks at how the scheme works in Chambamontera and how it benefits the community. Entire lesson on human migration- reasons why people move. Strong emphasis on crucial key words and examples. More suited for KS3 or low ability KS4. Learning objectives: To know what a push and pull factor is. 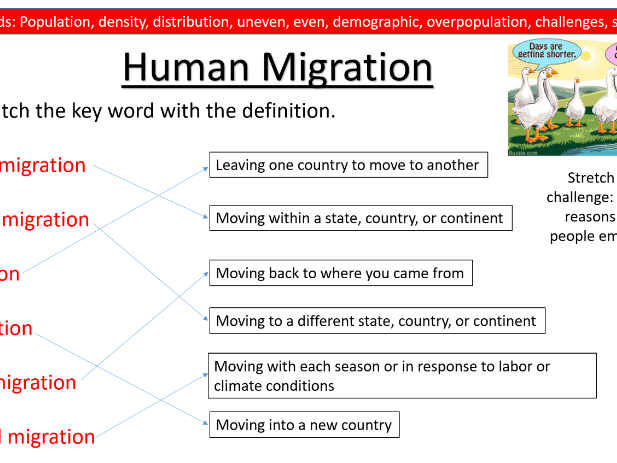 To understand how push and pull factors can influence migration. Excellent if we are able to explain how migration is portrayed in the media. Includes tasks such as connecting key words to definitions, progress check quizzes, mindmaps for independent thought, differentiated plenary tasks to check understanding. Includes a homework research task: 1). Research a city in India. E.g. Mumbai/ New Delhi/ Chennai. 2). Write a paragraph explaining the characteristics of this city and reasons why people may want to move to/from this city. (push and pull factors) Any questions- just ask! 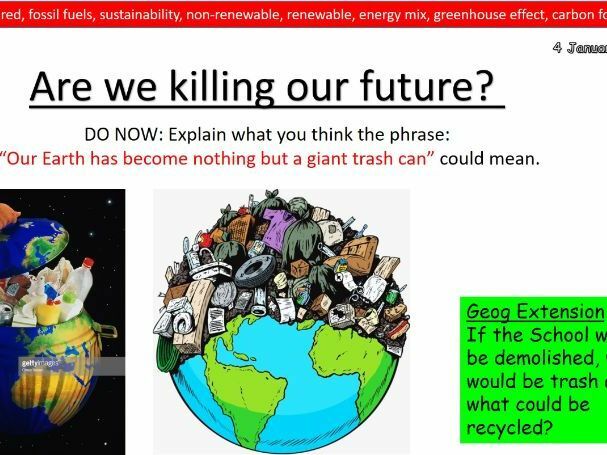 Entire Unit for KS3- Endangered Earth- Focus on Fossil Fuels and how we are damaging the Earth. Includes lessons, activities and assessments. Topics of lessons: fossil fuels, carbon footprint, climate change, greenhouse effect, sustainable energies and renewable energy. Please ask any quesitons. 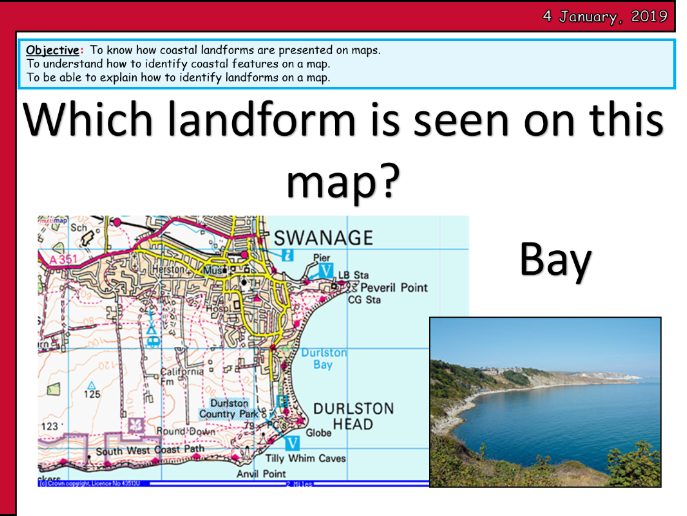 Entire lesson focusing on knowledge of coasts and applying it to map skills- grid references and identifying landforms on an OS map. Ideal for GCSE revision. Geography AQA Paper 2- The Changing Economic World. 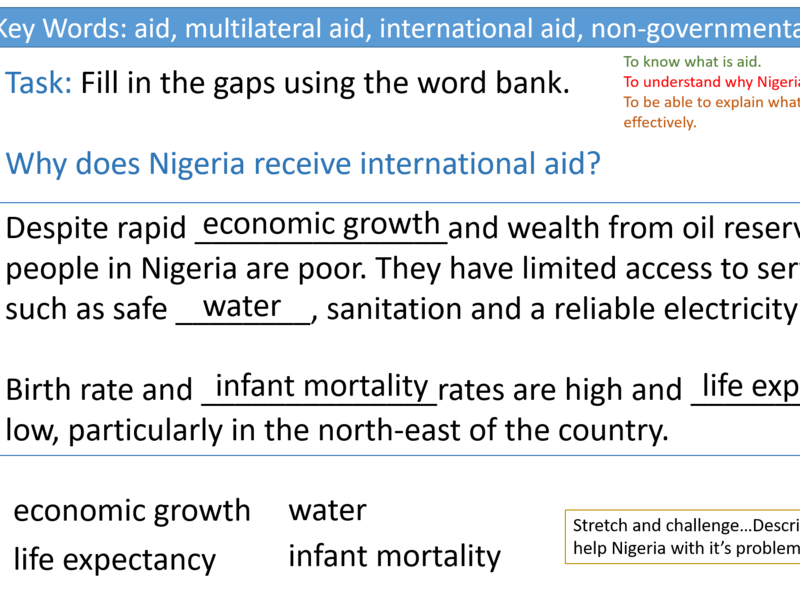 Nigeria Case study. Includes: Location, key terms, economic development, TNCs- Shell, environmental challenges and opportunities. Please ask questions- there are videos, images, differentiated tasks, exam practice questions that have peer marking opportunities and homework tasks embedded. Very detailed lessons with many tasks and opportunities for teaching- can be split into two lessons per one lesson to support lower ability and shorter classes, or to stretch out the scheme of learning- some of these lessons require two sessions to teach. Perfect bunch of lessons to use for Year 11 revision as well as teaching new to other GCSE classes. 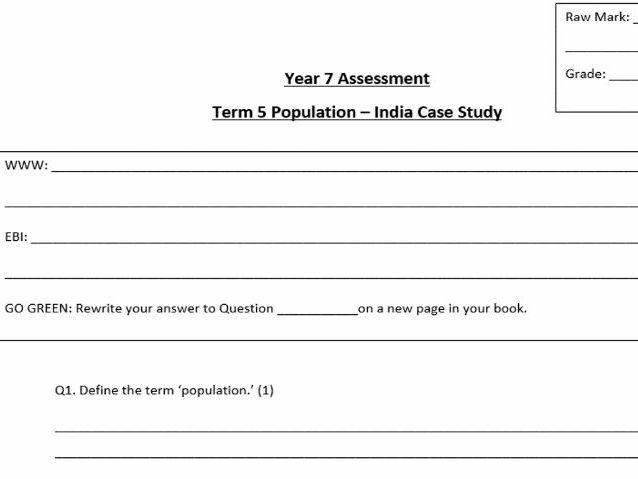 Assessment for geography topic ‘population’ with the challenges and opportunities of a growing population in India. Questions ranging in marks 1-6. Comes with boxes for EBI/WWW and an option for students to rewrite and improve questions. Please ask questions for more information.